The 2012 officers and Board of Directors of the Medical and Health Librarians Association of the Philippines (MAHLAP) presented a Plaque of Appreciation to the Central Visayas Consortium for Health Research and Development (CVCHRD) on February 27, 2013 at Hotel Elizabeth, Cebu City. The Participants were: Prof. Sandy C. Lasa of USI, chairman of the ERC; other USI faculty- Profs Janet S. dela Cruz, Teresa B. Pambid, Glenda C. Icaro, Mary Ann Tumbado, and Mr. Rhandy V. Salvani; Prof. Elma R. Peralta and Dr. Ma. Clara Ll. Rubino Faculty and Dean respectively of Ateneo de Naga University (AdNU); Dr. Yolanda L. Castroverde and Dr. Carmelita S. Baylon of the University of Nueva Caceres (UNC); Dr. Raul G. Bradecina, Profs. Ana L. Vargas, and Emelina R. Padayao of Partido State University (PSU); Dr. Nilo B. Romeroso of Ago Medical Center-Bicol Christian College of Medicine (AMEC-BCCM); Prof. Joyce S. Obis of University of Saint Anthony (USANT); Prof. Athena G. Masip of Aquinas University of Legazpi (AUL); researchers and BCHRD committee members who were part of the Bicol University delegation included Dr. Richard L. Bartolata (BUCN), Profs. Ida Francia H. Revale and Daile Meek Salvador-Membreve (BUCS), Profs. Michael Angelo D. Brogada and Aris J. Ordoñez (BUCS-CS/IT), Prof. Ma. Corazon R. Naz, (BUESC), Profs. Carina B. Orden and Dennis B. Gogola (BUTC), BCHRD Director Dr. Alma S. Banua, and the BCHRD Secretariat composed of Ms. Reizha O. Rito and Ms. Maria Vicenta Corazon B. Guidote. Also present was Ms. Marie Jeanne “Gigi” B. Berroya, PCHRD-DOST Regional Project Officer for Region V.
The two-day training/seminar involved pre- and post-tests, lectures, small group discussions, and critiquing of proposals. The training ended with setting of the deadline for submission of revised proposals to the BCHRD secretariat, (total of 5 proposals) and finalization of the R&D and ERC Standard Operating Procedures. The Human Resource Development Committee (HRD) of the Health Consortium in Western Mindanao recently concluded its 3-day Health Research Proposal Writeshop. The first of its kind in the region, it is geared to facilitate researchers with developing technically and ethically sound and fundable research proposals. The 1st day begun with a series of plenary sessions to give the beginning researchers an idea of what the consortium is all about as well as the health concerns of the region which, was discussed by Dr. Ma. Agnes Z. Mabolo, RICU Chair and Medical Specialist of DOH-CHD 9, focused on the familiarization to ZCHRD, the NUHRA and RUHRA, and the health status of Region 9. Dr. Servando D. Halili, Jr., HRD Chair, continued the plenary sessions with a Lecture on Crafting the Research Problem. Deparment of Nursing, Brent Hospital and Colleges, Inc.
Day 2 commenced with R&D Chair Dr. Chona Q. Sarmiento's lecture on the Quantitative aspect of the Health Research Methodologies followed by Dr. Servando Halili for the Qualitative aspect. The participants were asked to improve their proposals based on the lectures given. Ms. Wilma I. Santos of the Philippine Council for Health Research and Development (PCHRD) announced that the Call for Nominations to the Gruppo Medica and the Outstanding Health Researcher Award is now accepting nominations. On the 3rd day, the participants were asked to present their work to a panel of critiques. The workshop ended with the critiques giving the participants two (2) weeks to revise their proposals still with the help of their respective mentors and re-submit to ZCHRD for the R&D Evaluation. 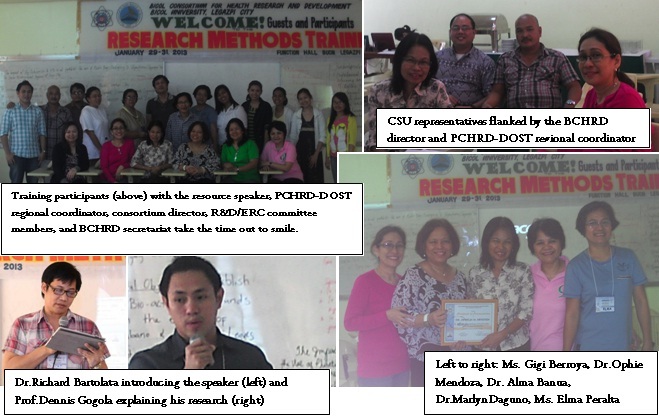 The Health Research and Development Consortium Region IV-A (HRDCR IV-A) conducted a Research Methods Workshop on February 5-8, 2013 at the Retreat and Conference Center De La Salle University-Dasmarinas. Dr. Melchor Victor G. Frias, IV, HRDCR IV-A Convenor, challenged the participants in his welcome address to come up with their respective proposals after the workshop for funding, he also emphasized that the research should be directed to the priorities identified in the National Unified Health Research Agenda (NUHRA). The activity was spearheaded by the consortium’s subcommittee on capacity building headed by Dr. Rommel L. Salazar. Consortium members Cavite State University, Mary Mediatrix Medical Center, Manuel S. Enverga University Foundation, Lyceum of the Philippines University-Batangas, Department of Health-Center for Health and Development Region IV-A, De La Salle Health Sciences Institute, De La Salle Lipa, Daniel O. Mercado Medical Center, Batangas Regional Hospital and De La Salle University-Dasmariñas were all represented. The workshop introduced participants to basic concepts on conducting health research. Lectures were given on topics such as: selecting research topics, formulating research objectives, designing a research and analyzing and interpreting research results. The seminar was structured in three activities: 1.) lecture-discussion; 2.) workshop and 3.) plenary sessions. The speakers were Dr. Carmen Tolabing and Prof. Kim Cochon of the University of the Philippines, College of Public Health. Dr. Frias also helped facilitate the discussions. At the end of the workshop, the participants who were grouped according to their institutions were able to come up with draft proposals on disability among school-aged children, threatened abortion, health risk factors among adolescents, leptospira infection and Human Immunodeficiency Virus (HIV). The groups will work on their proposals and literature review before the second capacity building activity which is a Research Protocol Writeshop. This will guide them in drafting and fine-tuning their final research proposals. 31 JANUARY 2013 | GENEVA - Adults should consume less than 2,000 mg of sodium, or 5 grams of salt, and at least 3,510 mg of potassium per day, according to new guidelines issued by the WHO. A person with either elevated sodium levels and low potassium levels could be at risk of raised blood pressure which increases the risk of heart disease and stroke. Potassium-rich foods include: beans and peas (approximately 1,300 mg of potassium per 100 g), nuts (approximately 600 mg/100 g), vegetables such as spinach, cabbage and parsley (approximately 550 mg/100 g) and fruits such as bananas, papayas and dates (approximately 300 mg/100 g). Processing reduces the amount of potassium in many food products. Currently, most people consume too much sodium and not enough potassium. The guidelines are an important tool for public health experts and policymakers as they work in their specific country situations to address noncommunicable diseases such as heart disease, stroke, diabetes, cancer and chronic respiratory diseases. Public health measures to reduce sodium and increase potassium consumption and thereby decrease the population’s risk of high blood pressure and heart disease can include food and product labelling, consumer education, updating national dietary guidelines, and negotiating with food manufacturers to reduce the amount of salt in processed foods. WHO is also updating guidelines on the intake of fats and sugars associated to reduced risk of obesity and noncommunicable diseases. The Bicol Consortium for Health Research and Development (BCHRD) organized a three-day Research Methods Training on January 29-31, 2013 with the following objectives: 1) Equip the participants with research methodologies; 2) Assist participants in refining the methodology of their research proposals; and 3) Assist the participants in packaging the research proposals, in preparation for the technical and ethical review by the consortium evaluators. The training was facilitated by the Consortium Director Dr. Alma Banua and the PCHRD-DOST Regional Coordinator Ms. Marie Jeanne Berroya. It was participated by the chairpersons and members of the BCHRD Research and Development (R&D) and Ethics Review (ERC) Committees, as well researchers from the different member-agencies of the consortium. Doctors, nurses, and professors from the different schools, institutions, and agencies came all the way from as far as Catanduanes and Camarines Sur to join their local counterparts in Legazpi City. 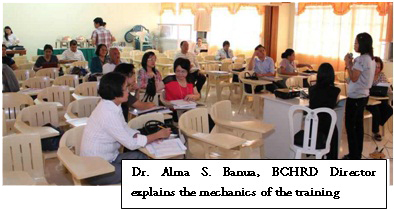 The member-agencies of BCHRD represented during the training were: Catanduanes State University (CSU)- Dr. Alvin Ogalesco and Prof. Joel Olfindo; University of Saint Anthony (USANT)- Prof. Joyce Obis; Ateneo de Naga University (AdNU)- Ms. Elma Peralta; University of Nueva Caceres (UNC)- Dr. Carmelita Baylon and Dr. Yolanda Castroverde; Camarines Sur Polytechnic Colleges (CSPC)- Ms. Salvacion Tablanza and Ms. Ma. Angela Concepcion Nolasco; Partido State University (PSU)- Ms. Emelina R. Padayao; Aquinas University (AUL)- Ms. Athena G. Masip; Bicol Medical Center (BMC)- Dr. Marla Litam; BRTTH- Dr. Marlyn Daguno and Ms. Bernardita Patacsil; and Department of Health (DOH)- Dr. Aurora Daluro, aside from BCHRD host agency Bicol University, which had participants from the College of Nursing- Dr. Richard Bartolata and Prof. Garry Grageda; College of Science- Profs. Ida Revale, Jocelyn Serrano, Joan Nace, Daile Meek Membrere and Mr. Michael Angelo Brogada; Tabaco Campus- Profs. Carina Orden and Dennis Gogola; and RDC- Dr. Arnulfo Mascariñas. Also present were the BCHRD Secretariat composed of Ms. Maria Vicenta Corazon Guidote, Ms. Reizha Rito, and Ms. Eunice Endrano. The participants were privileged to have as resource speaker the in-demand and highly recommended Dr. Ophelia “Ophie” M. Mendoza, a PCHRD consultant and research expert. 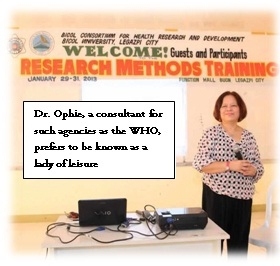 Dr. Ophie holds several degrees including Master of Science in Public Health (Biostatistics) and Doctor of Public Health (Biostatistics) from the University of North Carolina at Chapel Hill as well as the degrees of Bachelor of Science in Statistics, and Master in Statistics from the University of the Philippines. A researcher in her own right with a considerable number of researches to her name both here and abroad, it is only fitting that she would be recommended by no less than the PCHRD-DOST itself, to give lectures during seminars that it funds. Needless to say, Dr. Ophie did not disappoint; evaluation from the participants all contained rave-reviews of how well she delivered the lectures which were very comprehensive, and how she was able to simplify even the most complicated topics. The training followed a challenging daily lecture-workshop-plenary schedule that really squeezed the creative juices out of the committee members and researchers, who were all required to give presentations as well as evaluate each other’s outputs. Dr. Ophie was on hand to assist the R&D and ERC committees in the critiquing. On the whole the BCHRD is happy with the fifteen (15) research proposals that were presented, and hopeful that with certain revisions, they will be ready to be submitted to the R&D and ERC committees for technical review, in preparation for submission to PCHRD for final consideration. 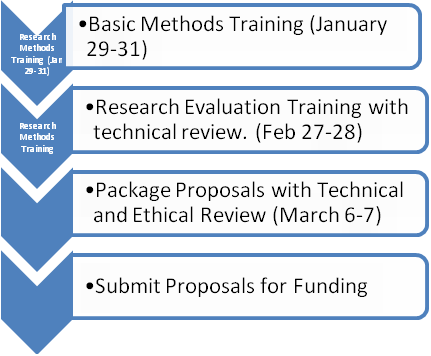 Further trainings will be held to give assistance to the researchers in the refinement of their proposals.